Each model in the 2018 Dodge Journey now comes with brand-new "Black Noise" 19-inch aluminum wheels. The Journey SE model has the option to add a Blacktop package in 2018. Additionally, the Dodge Journey also now offers a third row-seat to raise the passenger count up to seven. 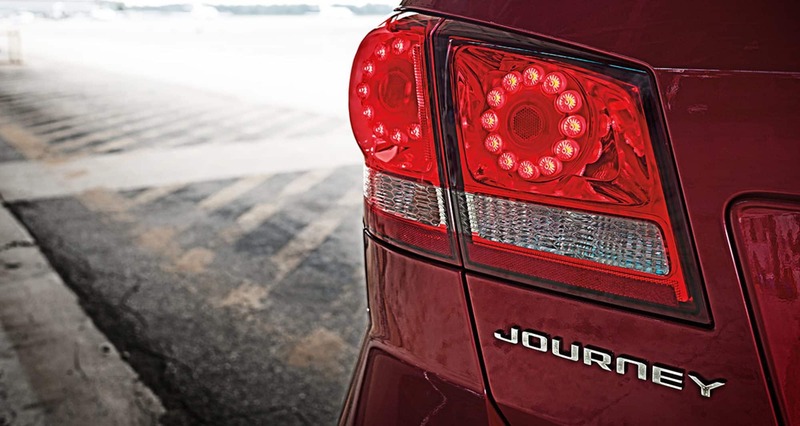 If you are interested in learning more about the Dodge Journey and any of its four models read on! What comes standard with each trim level? The basic standard equipment found on all trims includes a keyless enter n' go, removable in-floor storage bins, and a heated steering wheel. The SE trim on the Dodge Journey adds keyless entry and ignition, a height-adjustable driver seat, and dual-zone climate control. With each trim adding to the ones below it the SXT trim includes a Connectivity and Equipment package to add features like an 8.4-inch Uconnect touchscreen, rear parking sensors, and an overhead console. The Crossroads is the final trim level with a security alarm system, an included Trailer Tow Prep package, and a premium stereo system. This SUV comfortably seats up to seven passengers and offers a maximum cargo space of 67 cubic feet. How many engines are available to choose from? Two engines are available to the 2018 Dodge Journey. The first engine comes standard on the SE, SXT, and Crossroad trims. This engine is a 173 horsepower 2.4-liter inline-4 with 166 lb-ft of torque. The second engine is a 3.6-liter V6 with 260 lb-ft of torque and 283 horsepower. This engine is available to all models and comes standard on the GT. The 3.6-liter V6 has an EPA fuel economy rating of 25 miles per gallon and has the choice of front-wheel drive or all-wheel drive, while the first engine is standard with front-wheel drive only. The Dodge Journey has over 40 safety and security features available. If you want safe the Journey comes with standard electronic roll mitigation with brake assist, a large rearview camera display with rear parking sensors, a LATCH child seat anchor system, and electronic stability control with all-speed traction control. If you are looking to add further features for safety and security, look no further than the upper trim levels. The SXT Premium package even offers a conversation mirror that provides an easy sight of all passengers. The Dodge Journey is the perfect vehicle for anyone looking to take your family on the greatest of adventures. Give us a call to come see our lineup!